The British artist Stuart Semple is launching a campaign to raise awareness and abolish “hostile design” across the globe after his local council retrofitted bars across benches in a bid to stop homeless sleepers lying on them. Bournemouth Council confirmed the changes were made a few months ago, but the new design only came under scrutiny after Semple posted a picture on his Facebook page over the weekend. “It had a million views in one day,” the artist says. People commenting on the post accused the council of being “inhumane” and “disgraceful”. Opinions have become more divided about homelessness since Brexit, Semple says. Official government figures show that the number of people sleeping rough in England hit a record-high in 2017, after a 73% increase over the past three years. 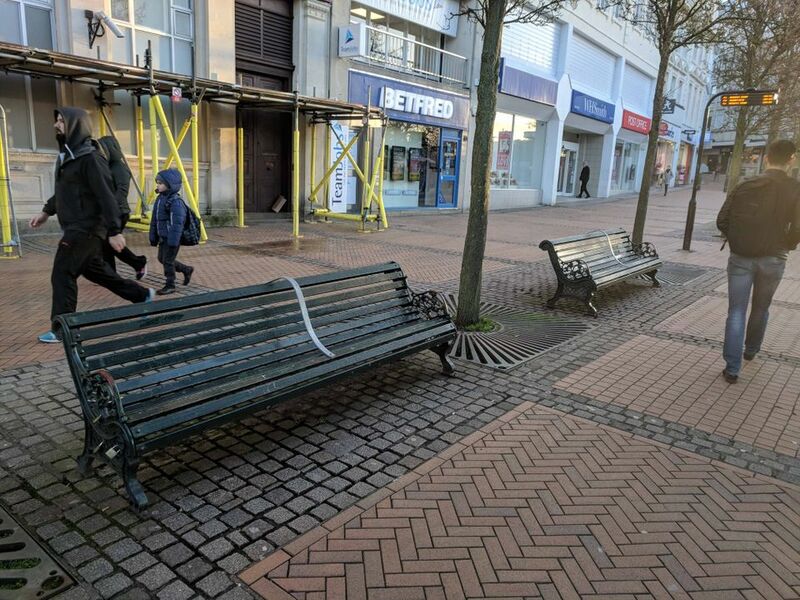 Bournemouth Council says it had made changes to “one or two benches in very specific locations in the town centre several months ago” following complaints from shopkeepers and members of the public. “As a council, we need to maintain a careful balance between our responsibility to the wider public to ensure that amenities are available to them, and our duty of care to vulnerable members of our community, including people rough sleeping,” it says, noting that the council delivers a wide range of services, including 150 hostel beds for homeless people. But Semple believes current policies are weighted against rough sleepers. “Hopefully this campaign will enable everyone to highlight hostile design in their own towns and cities and put a stop to this brutal inhumane practice. Our towns and cities should be for everyone,” he says. Semple has considerable experience of urban design. For the past two years he has been working with the city of Denver to transform its public spaces into friendlier, more connected places. The radical intervention, titled Happy City, will be unveiled in May and includes a mock confessional box inside Union Station, where commuters and travellers will be able to confide in one another in private. The piece, Emotional Baggage Drop, has been co-organised by the Denver-based nomadic museum, Black Cube.